Premier Prints Alex Oxford Ocean Outdoor fabric. 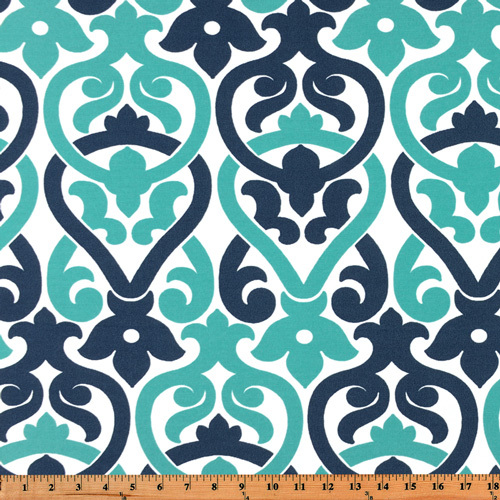 Contemporary damask design in navy blue and turquoise on a white background. Premier Prints outdoor fabrics are screen printed on spun polyester and have a stain/water resistant finish. These fabrics withstand direct sunlight for up to 1000 hours insuring durability and versatility, perfect for outdoor settings and indoor living in sunny rooms, great family friendly fabric! Create decorative toss pillows, chair pads, placemats, tote bags and much more. To maintain the life of the fabric bring indoors when not in use. *Use cold water and mild detergent (Woolite). Drying is NOT recommended - Air Dry Only - Do not Dry Clean.